WOOLWICH TOWNSHIP, N.J. — A school bus driver here was injured after crashing into a garage behind a high school on Wednesday, WPVI reports. 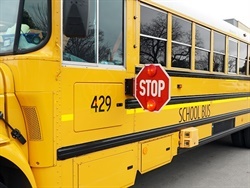 Officials from Kingsway Regional High School told the news source that the incident occurred around 6:30 a.m. when the driver was heading out of the bus lot in the rear of the school. The driver made a sharp turn and lost control of the bus, causing significant damage to the building, according to WPVI. No students were on board at the time. The driver suffered a cut to her forehead and was transported to the hospital for her injuries, the news source reports. Jim Lavender, the superintendent for Kingsway Regional School District, told WPVI that the driver, who has been with the district since 2015, has a clean driving record, and was “pretty shaken up” after the crash. Lavender added that he thinks the driver will be fine, but the district won’t know what happened until he has a chance to speak with her. Officials told the news source that they aren’t sure what caused the crash, but the investigation is ongoing.